It will give fans renewed - if still quite faint - hopes of their team making the play-offs and will lift confidence ahead of the final month of an at-times difficult season. Ashton Leigh and Reece Myles-Meekums kept their places in the side as the Rocks lined up boasting a full bench. Early on Anthony Mendy found Reece Beckles-Richards on the right and he burst through before cutting the ball inside the area but Irnti Rapai's strike was blocked by Harvey Read. Mendy hit a cross from the left but it bounced kindly into the path of Leigh, who dealt with the danger. Sean Cronin hacked another Walsh cross out before a Harvey Whyte short free-kick to Walsh broke down. Walsh was denied a chance when he cut inside from the left before shooting low and forcing Shane Gore into a decent save. Gore gathered a cross in front of his goalmouth after good play from Doug Tuck and Leigh on the left. Keaton Wood blocked a cross from Beccles-Richards and Wingate won a corner. Read and before Wood dealt with it. A Rapai corner curled down into Bognor's area but the header towards goal by Donavan Makoma was volleyed off the line by Theo Widdrington. Widdrington won a free-kick after being tripped outside the box. He took it himself but it sailed over the bar. Bradley Lethbridge was penallised for a handball after a forward ball by Wood. Makoma clashed with Dan Lincoln as the ball was pumped back into the area in another Blues attack. Makoma was sent off with a straight red card for his leap, connecting with his studs on Lincoln in a dangerous clash and the goalkeeper needed treatment on 24 minutes. Lincoln was able to continue after a lengthy stoppage. A lofted ball into the area saw Widdrington glance his header towards goal but Gore was well placed to save on 34 minutes. A long throw by Tanasheh Abrahams was causing the Rocks problems at the back but another header on by Rapai had to be punched out by Lincoln but the offside flag was up. Leigh burst down the left before cutting it inside to Tuck who curled it towards the near post - but Gore pushed it around the post. Mendy responded by running through the middle with gaps appearing in the Rocks defence but Tuck tracked back before the striker shot low at goal - but a great save by Lincoln denied him. Walsh set up Whyte outside the box but he belted his attempt well over. Leon Maloney replaced Read for Bognor on 52 minutes. Tuck was blocked with a low ball into the box before Widdrington smacked another chance over the crossbar on the rebound. Abrahams hit one after good play from Ola Williams from just outside the area but Lincoln was equal to it. Widdrington's cross-field ball to Lethbridge saw him turn inside but into a group of defenders who blocked him on 58 minutes. Leigh's cross from the left was knocked out to Maloney who curled it just wide. Widdrington found Leigh on the left. The full-back curled it in but with Lethbridge in pursuit ahead of his marker, the ball was deflected high over the bar. Bognor got the goal they were looking for though on 70 minutes. Walsh beat his man after good work from Leigh on the left and Lethbridge created some space, and Walsh placed his shot low into the net following a defensive slip-up. Rapai smashed one over the crossbar with his left foot on 72 minutes. Maloney did well to work his way across the goal before passing it to Walsh, who hit it early and low into the bottom left corner on 75 minutes. Lethbridge held the ball up well for sub Jimmy Wild, who turned instantly before shooting low but straight at Gore. Manu made his way through the Bognor defence before sliding the ball low into the arms of Lincoln on 85 minutes. Njie fired the ball across the face of goal before Rapai was replaced by Charlie Ruff on 86 minutes. Lethbridge had the ball in the net again on 87 minutes with a powerful header from Maloney's curling cross but the linesman had his flag up for offside. Then Lethbridge did well to run inside the defender before running long the byline before he hit it towards the near post, but it was well saved by Gore. Lethbridge did well to stretch his legs and run across the box. Maloney cut the ball back to Widdrington, who smashed another chance over the bar to end a better second half display from the visitors. 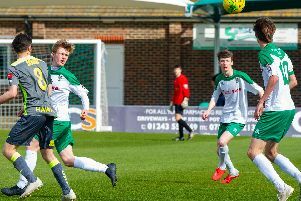 Bognor move back up to ninth in the division. 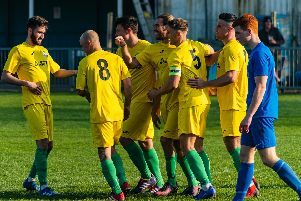 They welcome Brightlingsea Regent at home on Saturday.